본 발명은 스마트카드 리더가 구비된 쌍방향 카드데이터 인터페이스장치에 관한 것으로, 내부에 스마트카드 리더기를 장착한 상태에서, 그 일단에 USB 포트가 구비되어져 있고 그 타단에는 휴대폰에 삽입되는 데이터포트가 구비되어 휴대폰 내부의 스마트카드 칩의 정보는 물론이고 외부에서 접촉 및 비접촉되는 스마트카드의 카드칩 정보를 범용적으로 PC로 인터페이스하기 위한 스마트카드 리더가 구비된 쌍방향 카드데이터 인터페이스장치를 제공함에 그 목적이 있다. The present invention relates to a smart card reader is provided with two-way card data interface device, it has been provided with in a state of mounting the smart card reader therein, USB port on one end and the other end thereof is provided with a data port to be inserted in the phone information of the mobile phones inside the smartcard chip as well as it is an object to provide a contact and a card chip information of the smart card is a non-contact provided with a general-purpose by a smart card reader for interfacing with a PC interactive card data interface device in the external . 본 발명을 적용하면, 사용자가 휴대하고 다니면서, 휴대폰을 포함한 외부기기에 탑재된 IC칩으로부터 카드정보를 PC로 인터페이스할 수 있으며, 외부의 다양한 비접촉식 IC 카드로부터 카드정보를 독취하여 PC로 인터페이스할 수 있으므로 카드정보 인터페이스의 범용성이 매우 크며, 내부에 탑재된 스마트카드 리더가 카드독취시에만 전력을 소모하게 되므로 전력 소모량이 매우 작다는 장점이 있다. When applying the present invention, the user is mobile and go around, it is possible to interface the card information from the IC chip to an external device including a cellular phone to the PC, it takes reading the card information from a variety of non-contact type IC card, external to the interface to the PC since very large and the versatility of the card interface, so that the smart card reader mounted therein consumes power only when the reading card is advantageous, the power consumption is very small. 스마트카드, 스마트카드리더, 비접촉식 IC카드, USB 포트, 데이터 포트. Smart cards, smart card readers, contactless IC card, USB port and a data port. 본 발명은 스마트카드 리더가 구비된 쌍방향 카드데이터 인터페이스장치에 관한 것으로, 보다 상세하게 내부에 스마트카드 리더기를 장착한 상태에서, 그 일단에 USB 포트가 구비되어져 있고 그 타단에는 휴대폰에 삽입되는 데이터포트가 구비되어 휴대폰 내부의 스마트카드 칩의 정보는 물론이고 외부에서 접촉 및 비접촉되는 스마트카드의 카드칩 정보를 범용적으로 PC로 인터페이스하기 위한 스마트카드 리더가 구비된 쌍방향 카드데이터 인터페이스장치에 관한 것이다. The present invention relates to a two-way card data interface device with a smart card reader, and more particularly in a state of mounting the smart card reader therein, and one end of the USB ports been provided in and the other end thereof, the data port to be inserted in the phone is provided with information of the cellular phone inside the smartcard chip as well as relates to a contact and a card chip information of the smart card is a non-contact universally as a smart card reader provided for interfacing to the PC interactive card data interface device from outside. 주지된 바와 같이, 신용카드 및 현금, 직불 카드 등 다양한 카드는 카드 사용시 사용자 인증이 필수적으로 요구되고 있다. As is well known, credit and cash, debit cards, various card using the card user authentication is necessarily required. 특히, 최근에는 온라인 쇼핑시장의 규모가 커짐에 따라 PC나 휴대폰을 이용한 신용 결제가 활발하게 이루어지고 있다. In particular, in recent years, the credit payments are actively done using a PC or a mobile phone, depending on the size of the larger online shopping market. 또한, 최근에는 기술 개발이 활발하게 이루어지면서 휴대의 편의성까지 더 높이도록 휴대폰의 내부에 금융관련 스마트 카드를 장착하여 모바일을 이용한 결제 처리가 가능하도록 한 비접촉 또는 접촉식 카드방식의 휴대폰이 출시되고 있다. Further, in recent years, technical development has actively conducted As cell of more to the attached a financial smart card inside the mobile phone by a non-contact or contact type card, the payment processing to be using a mobile system handset height to ease of being released . 그러나, 휴대폰에 스마트 카드가 장착된 경우에는 PC를 통해 온라인 쇼핑을 진행하는 중에, 그 휴대폰의 스마트 카드를 이용하여 결제할 수 없다는 문제점이 있었다. However, if the smart card installed in the phone, there is a problem that you can not pay using a smart card of the mobile phone while traveling to shop online via a PC. 따라서, 최근에는 휴대폰의 스마트 카드 정보를 PC로 인터페이스하기 위해, 그 일단에는 USB포트가 장착되고, 그 타단에는 휴대폰의 커넥터에 삽입되는 데이터포트가 구비된 인터페이스 장치가 개발되어 출시되었다. Therefore, in recent years, in order to interface a smart card of the mobile phone to the PC, and one end thereof it has been equipped with a USB port, and the other end has been released is the interface device provided with a data port to be inserted into the connector of the mobile phone have been developed. 하지만, 이러한 인터페이스 장치는 단지 휴대폰 내부에 장착된 스마트 카드 정보를 PC로 단순 인터페이스하기 위한 장치에 불과하며, 다양한 스마트 카드나 신용카드 등에 장착된 스마트 카드로부터 카드 정보를 PC로 인터페이스하기 위해서는 별도의 카드리더기가 구비된 더미(Dummy) 단말기가 필요하였다는 문제점이 있었다. However, this interface device is only in order to interface the card from the smart card equipped with a smart card installed inside the phone is merely a device for simple interface to your PC, such as a variety of smart card or credit card to your PC separate card the reader is provided with a pile (dummy) terminal were required there is a problem. 즉, 종래의 인터페이스 장치는 범용성이 없다는 문제점이 있었다. That is, the conventional interface device, there is a problem that there is no versatility. 본 발명은 상기한 종래 기술의 사정을 감안하여 이루어진 것으로, 내부에 스마트카드 리더기를 장착한 상태에서, 그 일단에 USB 포트가 구비되어져 있고 그 타단에는 휴대폰에 삽입되는 데이터포트가 구비되어 휴대폰 내부의 스마트카드 칩의 정보는 물론이고 외부에서 접촉 및 비접촉되는 스마트카드의 카드칩 정보를 범용적으로 PC로 인터페이스하기 위한 스마트카드 리더가 구비된 쌍방향 카드데이터 인터페이스장치를 제공함에 그 목적이 있다. The present invention has been made in view of the circumstances of the prior art, it has been provided with in a state of mounting the smart card reader therein, USB port on one end and the other end is provided with a data port to be inserted into the handset of the phone internal information on the smart card chip, as well as it is an object to provide a smart card reader the card is provided with two-way data interface apparatus for interfacing the card information of the smart card chip in contact and non-contact from the outside with a general-purpose PC. 상기한 목적을 달성하기 위해, 본 발명의 바람직한 실시예에 따르면 PC의 USB커넥터에 접속되는 USB 포트와; In order to achieve the above objects, the USB port, according to a preferred embodiment of the present invention connected to the USB connector of the PC; 상기 USB 포트와 직렬 연결되며, 휴대폰을 포함한 외부기기의 데이터 커넥터와 접속되는 데이터포트와; The USB port is a serial connection, and the data port to be connected to an external device, the data connector including a cell phone; 상기 USB 포트와 직렬 연결되며, 외부의 비접촉식 IC카드로부터 정보를 독취하기 위한 스마트카드 리더와; It is series-connected with the USB port, and a smart card reader for reading the information from the taking of the external non-contact IC card; 상기 USB 포트과 그 일단이 접속되며, 그 타단이 상기 데이터 포트와 스마트카드 리더에 각각 접속되어 전달 경로를 스위칭하는 스위칭부와; The USB poteugwa and its one end is connected, the switching unit for the other end are connected to said data port and a smart card reader switches the transmission path; 상기 스위칭부를 스위칭 제어하기 위한 주제어부로 구성되어, 외부기기 또는 비접촉식 IC 카드에 내장된 IC칩으로부터 카드정보를 독취하여 PC로 인터페이스하기 위한 것을 특징으로 하는 스마트카드 리더가 구비된 쌍방향 카드데이터 인터페이스장치가 제공된다. It is composed of a main controller for controlling the switching unit of the switching, the external device, or a smart card reader with two-way card data interface unit having a taking reading the card information from the IC chip embedded in the IC card, characterized in that for interfacing to the PC It is provided. 바람직하게, 상기 스마트카드 리더는 스마트카드 리더를 활동(Active) 상태로 설정하기 위한 키버튼부와; Preferably, the smartcard reader is a key for setting the smart card reader to the active (Active) state button unit; 상기 비접촉식 IC 카드로부터 카드정보를 수신하기 위한 안테나와; And an antenna for receiving the card information from the IC card; 상기 비접촉식 IC카드의 카드 정보를 추출하여 제어부 및 보안응용모듈(SAM)로 전송하기 위한 RF모듈과; RF modules for extracting card information of the IC card to transmit it to the control and security application module (SAM) and; 상기 RF 모듈로부터 수신한 정보를 이용하여 비접촉식 IC 카드를 인증하여 인증 결과를 제어부로 전송하기 위한 보안 응용 모듈과; Security application module to authenticate the IC card by using the information received from the RF module for transmitting an authentication result to the control unit and; 저장 장치에 수신데이터 및 인증데이터를 기록하여 스마트카드 리더에 직렬 통신 케이블을 통해 연결되어 있는 PC에 해당 데이터를 전송하여 결제를 포함한 카드서비스 처리를 수행하는 제어부로 이루어진 것을 특징으로 하는 스마트카드 리더가 구비된 쌍방향 카드데이터 인터페이스장치가 제공된다. Smart card reader, characterized in that consisting of a control unit for performing a storage device receiving the data and authentication by writing data smartcard card service processing, including payment by sending the data to the PC connected via the serial communication cable to the reader in the the two-way data interface card device with is provided. 바람직하게, 상기 스마트카드 리더가 구비된 쌍방향 카드데이터 인터페이스장치는 그 내부에 상기 데이터 포트와 직렬 연결되고 그 데이터 포트를 매개로 전송된 외부 기기 내의 스마트카드 칩 정보를 수신하기 위한 제 1 데이터 수신부와; Preferably, the smart card reader, the two-way card data interface device comprises a: a first data receiver for receiving the smart card chip information in the external device transmitting the data port and the serial connection and the data port to the parameters therein, . ; 상기 스마트카드 리더의 제어부로부터 카드의 IC칩 정보를 전달받아 수신하기 위한 제 2 데이터수신부와; And a second data receiver for receiving receives the IC chip of the card information from the controller of the smart card reader; 상기 스위칭부의 출력단에 접속되어 상기 스위칭부를 통해 전달경로가 설정된 상태에서 상기 외부 기기로부터 전달된 데이터 또는 상기 스마트카드 리더로부터 전달된 데이터를 인가받아 상기 USB 포트로 전송하기 위한 데이터 송신부가 더 포함된 것을 특징으로 하는 스마트카드 리더가 구비된 쌍방향 카드데이터 인터페이스장치가 제공된다. Is connected to the output terminal of the switching part that in a state in which the transmission path is set through the above switching the receiving application data transmitted from the data or the smart card reader transmitted from the external device further comprises data transmission unit for transmitting to the USB port a two-way data card interface device having a smart card reader according to claim is provided. 바람직하게, 상기 스마트카드 리더가 구비된 쌍방향 카드데이터 인터페이스장치는 그 내부에 상기 USB 포트의 전원단과 접속되며, 상기 스마트카드 리더로 전원을 인가시키기 위한 충전부가 더 포함된 것을 특징으로 하는 스마트카드 리더가 구비된 쌍방향 카드데이터 인터페이스장치가 제공된다. Preferably, the smart card reader, the two-way card data interface device having a are connected end and power supply to the USB port therein, the smart card reader, characterized in that a charging section for applying a power to the smart card reader further comprises the two-way data interface card device is provided with a bar. 바람직하게, 상기 스마트카드 리더가 구비된 쌍방향 카드데이터 인터페이스장치는 그 내부에 상기 주제어부와 접속되며, 상기 데이터포트를 통한 외부 기기가 접속되었는 지를 판단하기 위한 외부기기 감지부와; Preferably, the smart card reader a two-way data interface card that is connected to the device with the main control unit therein, the external device detects an external device through the data port is to determine a connection destination doeeotneun unit; 상기 주제어부와 접속되어 상기 스마트카드 리더를 통해 비접촉 IC 카드가 대기하는 지를 감지하기 위한 카드감지부가 더 구비되어져 있으며, 상기 주제어부는 내부에 설정된 타이머에 의해 일정시간 간격으로 상기 외부기기 감지부와 카드감지부에 감지 제어신호를 발생하여 외부 기기와 비접촉 IC 카드의 존재를 감지하고, 그 감지여부에 따라 상기 스위칭부를 자동으로 스위칭하는 것을 특징으로 하는 스마트카드 리더가 구비된 쌍방향 카드데이터 인터페이스장치가 제공된다. The main controller is connected and has been added further includes the card detection for detecting whether the non-contact IC card is waiting via the smart card reader, the main control unit at a predetermined time interval by a timer set in the internal sense the external device unit and a card and generating a sensing control signal to the detection unit detects the presence of the external device and the non-contact IC card, a smart card reader, a two-way card having a data interface device, characterized in that the automatic switching unit the switching provided in accordance with whether the detection do. 바람직하게, 상기 스마트카드 리더는 그 내부에 상기 제어부와 접속되어져 있고, 일정시간 간격으로 제어부에 펄스신호를 발생시키며, 그 펄스 신호에 의해 구동되어 비접촉식 IC 카드의 접근감지용 신호를 생성하기 위한 웨이크업 펄스신호 발생부가 더 포함된 것을 특징으로 하는 스마트카드 리더가 구비된 쌍방향 카드데이터 인터페이스장치가 제공된다. Preferably, the smart card reader has been connected to the control unit therein, and generate a pulse signal to the control unit at a predetermined time interval, it is driven by the pulse signal wake for generating a signal for proximity detection of the IC card an up pulse signal generating additional smart card reader with two-way data card interface device having a characterized in that the further comprises is provided. 본 발명에 따른 스마트카드 리더가 구비된 쌍방향 카드데이터 인터페이스장치는 사용자가 휴대하고 다니면서, 휴대폰을 포함한 외부기기에 탑재된 IC칩으로부터 카드정보를 PC로 인터페이스할 수 있으며, 외부의 다양한 비접촉식 IC 카드로부터 카드정보를 독취하여 PC로 인터페이스할 수 있으므로 카드정보 인터페이스의 범용성이 매우 크며, 내부에 탑재된 스마트카드 리더가 카드독취시에만 전력을 소모하게 되므로 전력 소모량이 매우 작다는 장점이 있다. Smart-card reader a two-way card data interface device with an according to the present invention users carry and go around, from which the card information from the IC chip to interface to the PC, various non-contact IC card of the outer mounting to an external device, including mobile phones taking poison the card information may be interfaced to the PC card interface of a general purpose very large, so that the smart card reader mounted therein consumes power only when the reading card is advantageous, the power consumption is very small. 이하, 본 발명에 대해 도면을 참조하여 상세하게 설명한다. With reference to the drawings the present invention will be described in detail. 도 1은 본 발명의 일실시예에 따른 스마트카드 리더가 구비된 쌍방향 카드데이터 인터페이스장치의 외부 구성을 도시한 사시도, 도 2는 본 발명의 일실시예에 따른 스마트카드 리더가 구비된 쌍방향 카드데이터 인터페이스장치의 회로구성을 도시한 블록구성도이다. 1 is a perspective view showing the external configuration of the two-way card data interface device with a smart card reader in accordance with one embodiment of the present invention, Figure 2 is a two-way card data equipped with a smart card reader in accordance with one embodiment of the present invention a block diagram illustrating a circuit block configuration of the interface device configuration. 이를 참조하면, 본 발명의 일실시예에 따른 스마트카드 리더가 구비된 쌍방향 카드데이터 인터페이스장치(10)는 내부에 스마트카드 리더기를 장착한 상태에서, 그 일단에 USB 포트가 구비되어져 있고 그 타단에는 휴대폰에 삽입되는 데이터 포트가 구비되어 휴대폰 내부의 스마트카드 칩은 물론이고 외부에서 접촉 및 비접촉되는 스마트카드의 칩 정보를 범용적으로 PC로 인터페이스하기 위한 장치이다. Referring to this, been one embodiment of the smart card reader with two-way card data interface device 10 is provided with a according to the present invention is provided with in a state of mounting the smart card reader therein, USB port on one end and the other end It is provided with a data port to be inserted into the cellular phone handset of the internal smart card chip, as well as an apparatus for interfacing the chip information in the smart card that is in contact and non-contact from the outside with a general-purpose PC. 즉, 본 발명의 일실시예에 따른 스마트카드 리더가 구비된 쌍방향 카드데이터 인터페이스장치(10)는 휴대가 용이하며, 휴대폰 등의 외부기기(6)에 탑재된 스마트카드 칩의 정보는 물론이고, 내부에 장착된 스마트카드 리더(22)를 통해 다수의 비접촉식 IC 카드(2)에 탑재된 각 스마트카드 칩에 저장된 정보를 로딩하여 자동 스위칭함으로써 PC(8)로 인터페이스하기 위한 장치인 것이다. That is, the two-way card data interface device 10 is equipped with a smart card reader in accordance with one embodiment of the present invention is portable and easy, and information on the smart card chip to an external device (6) such as a mobile phone, as well as loads the information stored on each smart card chip mounted in the plurality of non-contact type IC card (2) via a smart card reader (22) mounted therein by automatically switching to a device for interfacing with PC (8). 이를 위해, 본 발명의 일실시예에 따른 스마트카드 리더가 구비된 쌍방향 카드데이터 인터페이스장치(10)는 그 몸체(12)가 슬림한 직육각면체의 형태로 구성되어져 있으며, 그 몸체(12)의 전후방 양단에는 휴대폰 등 외부기기(6)의 데이터 커넥터(미도시) 및 PC(8)의 USB 커넥터(미도시)에 삽입되기 위한 데이터 포트(14) 및 USB 포트(16)가 각각 형성되어져 있다. To this end, one embodiment of smart card reader with two-way card data interface device 10 is provided with a according to the present invention has been configured in the form of a slim straight hexagonal tetrahedral the body 12, of the body 12 the front and rear ends have been formed, the data port 14 and the USB port 16 to be inserted into a USB connector (not shown) of the cellular phone, etc. (not shown), the data connector of the external device (6) and the PC (8). 상기 스마트카드 리더가 구비된 쌍방향 카드데이터 인터페이스장치(10)의 몸체(12) 상면 소정부에는 스마트카드 칩(4)이 내장된 비접촉식 IC 카드(2)를 안착시키고 가이드하기 위한 가이드턱(18)이 형성되어져 있으며, 또한 몸체(12)의 상면 소정부에는 외부의 비접촉식 IC 카드(2)로부터 카드정보를 센싱하도록 스마트카드 리더(22)를 활성화상태로 설정하기 위한 키버튼부(20)가 구비되어져 있다. It said smart card body (12) top surface a predetermined portion, the guide projection 18 for mounting the smart card chip (4) with built-in IC card (2) and guide a two-way card data interface device 10, the reader is provided with There are been formed, and the upper surface a predetermined portion, the key button unit 20 for setting the smart card reader 22 to the active state so as to sense the card information from the IC card 2 of the outer is provided with a body 12 It has been. 이때, 상기 가이드턱(18)은 상기 몸체(12)의 폭방향으로 형성되는 것이 바람직하며, 상기 가이드턱(18) 대신에 상기 몸체(12)의 상면이 비접촉식 IC 카드(2)의 크기에 적합하게 안착홈(미도시)이 형성되는 것도 가능하다. At this time, the guide projection 18 is fit to the size of the body 12. The body 12, the non-contact IC card (2) upper surface in place is desirable, and the guide projection 18 is formed in the width direction of the it is, however, possible that receiving groove (not shown) is formed. 본 발명의 일실시예에 따른 스마트카드 리더가 구비된 쌍방향 카드데이터 인터페이스장치(10)는 그 내부에 상기 데이터 포트(14)와 직렬 연결되고 그 데이터 포트(14)를 매개로 전송된 외부 기기(6) 내의 스마트카드 칩 정보를 수신하기 위한 제 1 데이터 수신부(36)가 구비되어져 있다. The external device transmitting the one embodiment of the smart card reader with two-way card data interface device 10 is provided with a according to the invention is series connected to the data port (14) therein, the data port 14, the medium ( a first data receiving unit 36 ​​for receiving a smart card chip information in the 6), been provided. 또한, 본 발명의 일실시예에 따른 스마트카드 리더가 구비된 쌍방향 카드데이터 인터페이스장치(10)는 그 내부에 스마트카드 리더(22)가 구비되어져 있는 바, 그 스마트카드 리더(22)는 내부에 키버튼부(20)가 구비되어져 비접촉식 IC 카드(2)와 데이터 송수신을 하기 위해 상기 스마트카드 리더(22)를 활동(Active) 상태로 설정한다. In addition, a bar, the smart card reader 22, the given embodiment the smart card reader is a two-way card data interface device (10) having in accordance with the present invention, a smart card reader 22 is provided therein is within the and it sets the smart card reader 22 to been provided with a key button unit 20 to the IC card 2 and the data transmission and reception in activity (active) state. 여기서, 활동 상태란 비접촉식 IC 카드(2)와 스마트카드 리더(22) 사이에서 데이터 송수신이 즉시 이루어질 수 있거나 이루어지고 있는 상태를 말한다. Here, the active state is the data transmitted and received between the IC card 2 and the smart card reader 22 or can be made immediately, it is a state that is made. 활동 상태에서 스마트카드 리더(22)는 비접촉식 IC 카드(2)와 데이터 송수신을 하기 위하여 특정 주파수 대역의 신호를 계속해서 외부로 송출한다. Smart card reader in the active state (22) is continuously sent out to the external signals in a particular frequency band to the IC card 2 and the data transmission and reception. 또한, 상기 스마트카드 리더(22)는 비접촉식 IC 카드(2)의 접근에 따라 비접촉식 IC 카드(2)에 유도 전류를 발생시키고, 발생된 유도전류에 의해 기전력이 발생되도록 함으로써 비접촉식 IC 카드(2)의 유도 전류를 통해 일정한 양의 전압이 축적되면 각종 카드의 정보가 포함된 리턴(Return) 신호를 IC칩(4)으로부터 출력하고, 출력된 리턴 신호는 스마트카드 리더(22)의 안테나(24)로 수신된다. In addition, the smart card reader 22 is a contactless IC card 2, the IC card 2 by allowing the electromotive force is generated by the induced current generated an induced current and, generated in accordance with the approach of the IC card (2) When the induced current is of a certain positive voltage accumulated outputs the return (return) signal containing the information of various card from the IC chip 4, and the output return signal comprises an antenna 24, a smart card reader (22) It is received by. 즉, 상기 스마트카드 리더(22)는 내부에 비접촉식 IC 카드(2)로부터 카드정보를 수신하기 위한 안테나(24)가 구비되어져 있다. That is, the smart card reader 22 has been provided with an antenna 24 for receiving the card information from the IC card (2) therein. 이때, 비접촉식 IC 카드(2)로부터 리턴 신호를 수신한 상기 스마트카드 리더 (22)는 데이터 송신시는 13.56 MHz의 주파수 대역, 데이터 수신시는 847 KHz의 주파수 대역을 이용하여 비접촉식 IC 카드(2)와 데이터를 송수신하게 된다. In this case, the receiving a return signal from the non-contact IC card 2, the smart card reader 22, the data sent during the during the band, the data reception of 13.56 MHz using a frequency band of 847 KHz non-contact IC card (2) It is transmitting or receiving the data. 한편, 상기 스마트카드 리더(22)는 내부에 카드 정보를 추출하여 제어부(30) 및 보안응용모듈(SAM : Security Application Module)(28)로 전송하기 위한 RF모듈(26)이 구비되어져 있는 바, 그 RF모듈(26)은 비접촉식 IC 카드로부터 수신한 신호에 포함된 정보(카드의 고유한 일련번호, 사용자의 신용 정보 및 기타 응용 정보 등)를 추출하여, 마이크로프로세서 등의 제어부(30) 및 보안 응용 모듈(SAM : Security Application Module)(28)에 전송한다. On the other hand, the smart card reader 22 extracts the card details on the internal control unit 30 and the secure application module (SAM: Security Application Module) (28) is the given comprising bar RF module 26 for transmitting to, the RF module 26 included in a signal received from the IC card information (a unique serial number of the card, the user's credit information, and other application information, etc.) to extract, the control unit 30, and security, such as a microprocessor and transferred to: (Security application module SAM) (28) application module. 보안 응용 모듈(28)은 RF 모듈(26)로부터 수신한 정보를 이용하여 비접촉식 IC 카드(2)를 인증하여 인증 결과를 제어부(30)로 전송한다. Security application module 28 by using the information received from the RF module 26 authenticating the IC card (2) transmits an authentication result to the control section 30. 제어부(30)는 저장 장치(미도시)에 수신데이터 및 인증데이터를 기록하여 스마트카드 리더(22)에 직렬 통신 케이블을 통해 연결되어 있는 PC(8)에 해당 데이터를 전송하여 결제 등의 카드서비스 처리를 수행하도록 한다. The control unit 30 is a storage device (not shown), receives data and authentication data, the recording to the smart card, such as payment by sending the data to the PC (8) connected via a serial communication cable to the reader 22, the card service to and to perform processing. 또한, 본 발명의 일실시예에 따른 스마트카드 리더가 구비된 쌍방향 카드데이터 인터페이스장치(10)는 그 내부에 상기 USB 포트(16)와 접속되며, 상기 스마트카드 리더(22)로 전원을 인가시키기 위한 충전부(32)가 구비되어져 있는 바, 상기 USB 포트(16)는 전원(V), 그라운드(G), 데이터(D+)(D-) 단자가 구비되어져 있으므로 상기 충전부(32)는 상기 USB 포트(16)의 전원단(V)과 접속되어 상기 스마트카드 리더(22)에 필요한 전원을 PC(8)로부터 공급받게 된다. 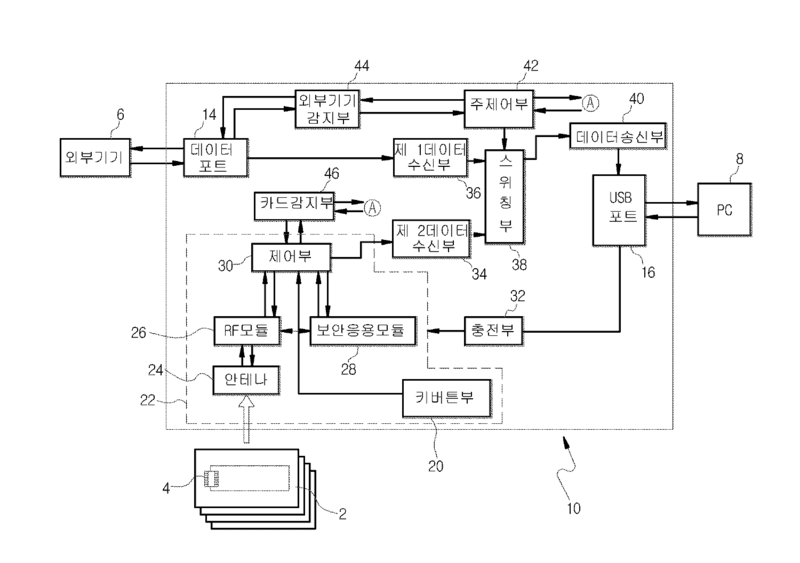 In addition, in one embodiment a smart card reader with two-way card data interface device 10 is provided with a according to the present invention is connected to the USB port (16) therein, to apply power to the smart card reader (22) been provided with the charging section 32 bar, the USB port 16, which for the power supply (V), a ground (G), data (D +) (D-), because the terminals been provided with the charging section 32 has the USB port is connected to the power supply terminal (V) of 16 is given to power required for the smart card reader 22 from the PC (8). 한편, 본 발명의 일실시예에 따른 스마트카드 리더가 구비된 쌍방향 카드데 이터 인터페이스장치(10)는 그 내부에 상기 스마트카드 리더(22)의 제어부(30)로부터 IC칩(4)의 정보를 전달받아 수신하기 위한 제 2 데이터수신부(34)가 구비되어져 있으며, 상기 외부 기기(6)로부터 전달된 데이터 또는 상기 스마트카드 리더(22)로부터 전달된 데이터의 전달경로를 스위칭하기 위한 스위칭부(38)가 상기 제 1, 2 데이터수신부(36,34)와 각각 접속되어져 있다. On the other hand, the information on the smart card reader to a two-way card provided with a data interface device 10 is an IC chip 4 from the control section 30 of the smart card reader (22) therein in accordance with one embodiment of the present invention a second data receiving unit 34 and been provided with a switching unit (38 for switching a transmission path of data transmitted from the data or the smart card reader 22 is transmitted from the external device (6) for reception by receiving ) can each been connected to the first and second data receiver (36,34). 또, 상기 스위칭부(38)에 스위칭 제어신호를 발생하기 위한 주제어부(42)가 구비되어져 있으며, 상기 스위칭부(38)의 출력단에는 데이터 송신부(40)가 접속되어져 있고, 그 데이터송신부(40)는 상기 스위칭부(38)를 통해 전달경로가 설정된 상태에서 상기 외부 기기(6)로부터 전달된 데이터 또는 상기 스마트카드 리더(22)로부터 전달된 데이터를 인가받아 상기 USB 포트(16)로 전송하는 역할을 수행한다. Further, the main control unit 42 for generating a switching control signal to the switching unit 38 and been provided, and an output terminal of the switching unit 38 has been data transmission unit 40 are connected, the data transmission unit (40 ) is to be applied it receives the data transmitted from the data or the smart card reader 22 is transmitted from the external device (6) transferred to the USB port 16 in a state in which the transmission path is turned on through the switching unit 38 It plays a role. 바람직하게, 본 발명의 일실시예에 따른 스마트카드 리더가 구비된 쌍방향 카드데이터 인터페이스장치(10)는 그 내부에 상기 주제어부(42)와 접속되며, 상기 데이터포트(14)를 통한 외부 기기(6)가 접속되었는 지를 판단하기 위한 외부기기 감지부(44)가 구비되어져 있으며, 상기 주제어부(42)와 접속되어 상기 스마트카드 리더(22)를 통해 비접촉 IC 카드(2)가 대기하는 지를 감지하기 위한 카드감지부(46)가 각각 구비되어져 있다. Preferably, it is connected to the main control unit 42, one embodiment a smart card reader with two-way card data interface device 10 is provided with a according to the present invention therein, the external device through the data port 14 ( 6) has been provided with the external device detection unit 44 for determining whether or connection, is connected to the main control unit 42 detects whether the non-contact IC card 2, the atmosphere via said smart card reader (22) the card detection unit 46 to have been provided, respectively. 따라서, 상기 주제어부(42)는 내부에 설정된 타이머에 의해 일정시간 간격으로 상기 외부기기 감지부(44)와 카드감지부(46)에 감지 제어신호를 발생하여 외부 기기(6)와 비접촉 IC 카드(2)의 존재를 감지하고, 그 감지여부에 따라 상기 스위칭부(38)를 자동으로 스위칭할 수 있게 된다. Thus, the main control unit 42 at a predetermined time interval by a timer set therein to generate a sensing control signal to the external device detection unit 44 and the card sensing unit 46, the external device (6) and the non-contact IC card, sensing the presence of (2), it is possible to automatically switch the switching unit 38 in accordance with the detected or not. 상기한 구성으로 이루어진 본 발명의 일실시예에 따른 스마트카드 리더가 구비된 쌍방향 카드데이터 인터페이스장치(10)는 기본적으로 상기 데이터 포트(14)를 통해 외부기기(6)가 접속된 상태의 데이터 전달경로가 상기 스위칭부(38)에 설정되어져 있다. Interactive card data interface device 10 is equipped with a smart card reader in accordance with one embodiment of the present invention is basically a data transfer of the connection device (6) via the data port 14 made of the above-described configuration has been the path is set to the switching unit 38. 즉, 상기 제 1 데이터수신부(36)를 통해 휴대폰 등의 외부기기(6) 내부에 장착된 IC칩(미도시)으로부터 각종 카드정보(카드의 고유한 일련번호, 사용자의 신용 정보 및 기타 응용 정보 등)를 전달받을 수 있게 설정되어져 있다. That is, the first data receiving unit 36, a proprietary variety of card information (card from the IC chip (not shown) mounted inside the external device (6) such as a mobile phone by using the serial number, the user's credit information, and other application information etc.) has been set up so you can get delivered. 따라서, 상기 데이터포트(14) 및 제 1 데이터수신부(36)를 통해 전달된 외부기기(6)의 카드정보는 상기 스위칭부(38) 및 데이터 송신부(40), USB 포트(16)를 통해 PC(8)로 전달되어 카드 결제 서비스 등을 수행하게 된다. Therefore, PC through the data port 14 and the first data receiving unit 36, the card information of the external apparatus 6 includes the switching unit 38 passes through, and data transmission unit (40), USB port 16 It is transferred to (8) will do the credit card payment service. 또한, 본 발명의 일실시예에 따른 스마트카드 리더가 구비된 쌍방향 카드데이터 인터페이스장치(10)는 상기 키버튼부(20)의 조작을 통해 상기 스마트카드 리더(22)를 활성화 모드로 전환시킬 수 있다. In addition, in one embodiment a smart card reader with two-way card data interface device 10 is provided with a according to the present invention can be converted to the smart card reader 22, through the operation of the key button unit 20 to the active mode, have. 상기 스마트카드 리더(22)가 활성화되면 안테나(24)를 통해 상기 비접촉식 IC 카드(2)를 자화시켜 내부의 IC칩(4)으로부터 각종 카드정보를 독취하여 상기 제 2 데이터수신부(34) 및 스위칭부(38)를 통해 PC(8)로 전송되게 된다. The smart card reader 22 when enabled by through the antenna 24 the magnetization of the non-contact IC card (2) taking poison various card information from the IC chip (4) within the second data reception unit 34 and the switching through part 38 it is to be transferred to the PC (8). 이때, 상기 스위칭부(38)는 주제어부(42)의 기설정 타이밍 시간에 따라 일정시간간격으로 스위칭부(38)가 자동 스위칭되는 바, 상기 키버튼부(20)가 활성화되게 조작되면 상기 주제어부(42)는 상기 스위칭부(38)를 스위칭 제어하여 전달 경로를 재설정하게 되고, 설정된 전달경로를 통해 상기 비접촉식 IC카드(2)의 정보를 PC(8)로 전달하게 된다. At this time, the switching unit 38 is the main controller when a predetermined time interval the switching unit 38 an automatic switching bar, the key button unit 20 is enabled to be operated to be in accordance with a preset timing time of the main control unit 42 part 42 is to reset the transmission path by switching control of the switching unit 38, and delivers the information of the IC card 2 to the PC (8) through the set transfer path. 한편, 본 발명의 일실시예에 따른 스마트카드 리더가 구비된 쌍방향 카드데 이터 인터페이스장치(10)의 내부에 외부기기 감지부(44)와, 카드감지부(46)가 구비된 경우라면, 상기 주제어부(42)는 상기 외부기기 감지부(44)와, 카드감지부(46)로부터 감지신호를 인가받아 상기 데이터 포트(14)에 외부기기(6)가 접속되었는 지, 또는 상기 스마트카드 리더(22)의 안테나(24)를 통해 비접촉식 IC카드(2)의 존재가 확인되었는 지를 판단하여, 그 판단에 따라 상기 스위칭부(38)를 스위칭 제어하여 데이터 전달 경로를 자동 설정한다. On the other hand, in case of the on the external device detection unit 44, a card detector 46 is provided inside of the two-way card data interface device 10 is provided with a smart card reader in accordance with one embodiment of the invention, the the main control unit 42 is not doeeotneun the external device detection unit 44 and the external device to the data port 14 receives applying a sensing signal from card detector 46 (6) is connected, or the smart card reader through the antenna 24 (22) determines whether or the presence of the non-contact IC card 2 is confirmed to be automatically set up a data transfer path by switching control of the switching unit 38 according to the determination. 그로인해, 설정된 전달경로를 통해 상기 비접촉식 IC카드(2)의 정보 또는 상기 외부기기(6)의 내부에 구비된 IC칩(미도시)의 정보를 PC(8)로 전달할 수 있게 된다. Thereby, it is possible to transfer information in the IC chip (not shown) provided in the interior of the non-contact IC card (2) of the information or the device (6) via the established transmission path to a PC (8). 이를 통해, 본 발명의 일실시예에 따른 스마트카드 리더가 구비된 쌍방향 카드데이터 인터페이스장치(10)는 사용자가 쉽게 휴대하고 다니면서, PC(8)를 통한 온라인 결제가 필요한 경우에 PC(8)에 구비된 USB 커넥터(미도시)에 상기 스마트카드 리더가 구비된 쌍방향 카드데이터 인터페이스장치(10)의 USB 포트(16)를 삽입하고 그 타단에 형성된 데이터포트(14)에 휴대폰 등의 외부기기(6)의 데이터커넥터(미도시)를 결합시켜 외부기기(6) 내부에 장착된 IC칩(미도시)으로부터 카드정보를 독취하여 PC(8)로 전달할 수 있다. This allows, in one embodiment a smart card reader with two-way card data interface device 10 is provided with a according to the present invention, go around, and be easy to carry, to the PC (8), if necessary, the online payment by PC (8) a USB connector (not shown), the smart card reader is inserted into the USB port 16 of the two-way card data interface device 10 with the external device of the mobile phone, such as a data port (14) formed in the other end (6 comprising ) by taking in the data connector (by combining not shown) reading the card information from the external apparatus 6, the IC chip inside the (not shown) may be passed to the PC (8). 또한, 본 발명의 일실시예에 따른 스마트카드 리더가 구비된 쌍방향 카드데이터 인터페이스장치(10)는 PC(8)를 통한 온라인 결제가 필요한 경우에 PC(8)에 구비된 USB 커넥터(미도시)에 상기 스마트카드 리더가 구비된 쌍방향 카드데이터 인터페이스장치(10)의 USB 포트(16)를 삽입하고, 그 상면에 다양한 비접촉식 IC카 드(2)를 안착시킴으로써 그 내부에 구비된 스마트카드 리더(22)를 통해 IC칩(4)의 카드 정보를 독취하여 PC(8)로 전송할 수 있으므로 범용성이 매우 높다. In addition, in one embodiment a smart card reader with two-way card data interface device 10 is provided with a according to the present invention (not shown), a USB connector provided on the PC (8), if necessary, the online payment by PC (8) a smart card reader provided therein by inserting the USB port 16 of the two-way card data interface device 10 with which the smart card reader, and seating the various non-contact IC card (2) on the upper surface (22 ) is very high in versatility by taking reading the card information of the IC chip 4 can be transmitted to PC (8) through. 더불어, 본 발명의 일실시예에 따른 스마트카드 리더가 구비된 쌍방향 카드데이터 인터페이스장치(10)는 상기 스마트카드 리더(22)가 상시 활성화상태로 존재하는 것이 아니므로, 전력 소모가 매우 낮으며, 상기 외부기기 감지부(44) 및 카드감지부(46)를 통해 외부기기(6)의 장착이나 비접촉식 IC카드(2)의 존재를 인지하고 자동으로 데이터 전달 경로의 스위칭이 이루어지므로 편의성도 매우 높다. In addition, were one embodiment of smart card reader with two-way card data interface device 10 is provided with a according to the present invention is very low as not to the smart card reader (22) is present in a constant active state, power consumption, the through an external device detection unit 44 and the card sensing unit (46) or the installation or the presence of a non-contact IC card 2, the external device 6, and automatically becomes the switching of the data transmission path composed of convenience is also very high . 도 3은 본 발명의 일실시예에 따른 스마트카드 리더가 구비된 쌍방향 카드데이터 인터페이스장치의 다른 회로구성을 도시한 블록구성도이다. Figure 3 is a block diagram showing another circuit configuration of a two-way data interface card device equipped with a smart card reader in accordance with one embodiment of the present invention; Fig. 이를 참조하면, 본 발명의 일실시예에 따른 스마트카드 리더가 구비된 쌍방향 카드데이터 인터페이스장치(10')는 그 내부에 상기 데이터 포트(14)와 직렬 연결되고 그 데이터 포트(14)를 매개로 전송된 외부 기기(6) 내의 스마트카드 칩 정보를 수신하기 위한 제 1 데이터 수신부(36)가 구비되어져 있다. Referring to this, an embodiment of an interactive card data interface device (10 ') having a smart card reader according to the present invention is series connected to the data port (14) therein, the data port 14, the medium a first data receiving unit 36 ​​for receiving a smart card chip information in the transmission device (6) has been provided. 또한, 본 발명의 일실시예에 따른 스마트카드 리더가 구비된 쌍방향 카드데이터 인터페이스장치(10')는 그 내부에 스마트카드 리더(22')가 구비되어져 있는 바, 그 스마트카드 리더(22')는 내부에 웨이크업(Wake-Up) 펄스 신호 발생부(48)가 구비되어져 있으며, 그 웨이크업 펄스신호 발생부(48)는 일정시간 간격으로 제어부(30)에 펄스신호를 발생시키며, 그 펄스 신호에 의해 구동되어 비접촉식 IC 카드(2)의 접근감지용 신호를 생성한다. In addition, in one embodiment a smart card reader, a two-way card data interface device 10 'is a smart card reader (22 therein') is a bar, the given provided that the smart card reader (22) provided according to the present invention the wake-up (Wake-up) has been provided with a pulse signal generation unit (48) therein, the wake-up pulse signal generation section 48 generates a pulse signal to the control unit 30 at a predetermined time interval, the pulse is driven by a signal generates a signal for proximity detection of the non-contact IC card (2). 웨이크업 펄스 신호에 의해 제어부(30)가 구동되기 전과 구동되어 접근 감지 용 신호를 송출하는 상태를 대기 상태라 하겠다. Is driven before and the control unit 30 driven by a wake-up pulse signal will la standby state to transmit a signal for proximity detection state. 대기 상태에서는 스마트카드 리더(22)와 비접촉식 IC 카드(2) 사이에서 데이터 송수신이 일어나지 않는다. In the standby state does not cause the data communicated between the smart card reader 22 and the non-contact IC card (2). 또한, 대기 상태에서 스마트카드 리더(22)는 대략 25 ㎂의 극히 작은 전류만을 소비하는 특징을 갖는다. In addition, the smart card reader in a wait state 22 is characterized in that consumes only a very small current of about 25 ㎂. 한편, 스마트카드 리더 장치(22)에서 송출된 접근 감지용 신호에 의해 비접촉식 IC 카드(2)의 접근이 감지되면 스마트카드 리더(22)와 비접촉식 IC 카드(2) 사이에서는 데이터의 송수신이 일어나는데, 이러한 상태를 활동 상태라 한다. On the other hand, if the smart card reader device 22, the access of the access detecting the IC card 2 by the signal sent out from a detected among the smart card reader 22 and the non-contact IC card 2 ileonaneunde the transmission and reception of data, this state is called activity. 또한, 상기 스마트카드 리더(22')는 비접촉식 IC 카드(2)의 접근에 따라 비접촉식 IC 카드(2)에 유도 전류를 발생시키고, 발생된 유도전류에 의해 기전력이 발생되도록 함으로써 비접촉식 IC 카드(2)의 유도 전류를 통해 일정한 양의 전압이 축적되면 각종 카드의 정보가 포함된 리턴(Return) 신호를 IC칩(4)으로부터 출력하고, 출력된 리턴 신호는 스마트카드 리더(22')의 안테나(24)로 수신된다. In addition, the smart card reader (22 ') are non-contact type IC card non-contact IC card by making (2), depending on approach generates an induced current in the non-contact IC card (2), and this electromotive force is generated by the generated induction current of (2 antenna of) a certain amount of when voltage is accumulated outputs the return (return) signal containing the information of various card from the IC chip 4, and outputs the return signal is a smart card reader (22 ') via the induction current ( is received as 24). 즉, 상기 스마트카드 리더(22')는 내부에 비접촉식 IC 카드(2)로부터 카드정보를 수신하기 위한 안테나(24)가 구비되어져 있다. That is, the smart card reader (22) has been provided with an antenna 24 for receiving the card information from the IC card (2) therein. 한편, 상기 스마트카드 리더(22')는 내부에 카드 정보를 추출하여 제어부(30) 및 보안응용모듈(SAM : Security Application Module)(28)로 전송하기 위한 RF모듈(26)이 구비되어져 있는 바, 그 RF모듈(26)은 비접촉식 IC 카드로부터 수신 한 신호에 포함된 정보(카드의 고유한 일련번호, 사용자의 신용 정보 및 기타 응용 정보 등)를 추출하여, 마이크로프로세서 등의 제어부(30) 및 보안 응용 모듈(SAM : Security Application Module)(28)에 전송한다. On the other hand, the smart card reader (22) extracts the card details on the internal control unit 30 and the secure application module (SAM: Security Application Module) (28) is the given comprising bar RF module 26 for transmitting to the , the RF module 26 the information extracts the (card unique serial number, the user's credit information, and other application information and the like), the control unit 30 such as a microprocessor included in a signal received from the IC card and and transferred to: (security application module SAM) (28) security application modules. 보안 응용 모듈(28)은 RF 모듈(26)로부터 수신한 정보를 이용하여 비접촉식 IC 카드(2)를 인증하여 인증 결과를 제어부(30)로 전송한다. Security application module 28 by using the information received from the RF module 26 authenticating the IC card (2) transmits an authentication result to the control section 30. 제어부(30)는 저장 장치(미도시)에 수신데이터 및 인증데이터를 기록하여 스마트카드 리더(22')에 직렬 통신 케이블을 통해 연결되어 있는 PC(8)에 해당 데이터를 전송하여 결제 등의 카드서비스 처리를 수행하도록 한다. The controller 30 is a card, such as payment by sending the data to the storage device (not shown), a smart card reader (22 ') PC (8) connected via a serial communication cable to record the received data and authentication data for and to perform service processing. 또한, 본 발명의 일실시예에 따른 스마트카드 리더가 구비된 쌍방향 카드데이터 인터페이스장치(10')는 그 내부에 상기 USB 포트(16)와 접속되며, 상기 스마트카드 리더(22')로 전원을 인가시키기 위한 충전부(32)가 구비되어져 있는 바, 상기 USB 포트(16)는 전원(V), 그라운드(G), 데이터(D+)(D-) 단자가 구비되어져 있으므로 상기 충전부(32)는 상기 USB 포트(16)의 전원단(V)과 접속되어 상기 스마트카드 리더(22')에 필요한 전원을 PC(8)로부터 공급받게 된다. Further, one embodiment of an interactive card data interface device (10 ') having a smart card reader according to the present invention is connected to the USB port (16) therein, the smart card reader (22' with the power) been provided with the charging section 32 bar, the USB port 16, which for applying the power source (V), a ground (G), data (D +) (D-), because the terminals been provided with the charging section 32 is the is connected to the power supply terminal (V) of the USB port 16, the power required for the smart card reader (22 ') receive the supply from the PC (8). 한편, 본 발명의 일실시예에 따른 스마트카드 리더가 구비된 쌍방향 카드데이터 인터페이스장치(10')는 그 내부에 상기 스마트카드 리더(22')의 제어부(30)로부터 IC칩(4)의 정보를 전달받아 수신하기 위한 제 2 데이터수신부(34)가 구비되어져 있으며, 상기 외부 기기(6)로부터 전달된 데이터 또는 상기 스마트카드 리더(22')로부터 전달된 데이터의 전달경로를 스위칭하기 위한 스위칭부(38)가 상기 제 1, 2 데이터수신부(36,34)와 각각 접속되어져 있다. On the other hand, information of the smart card reader is provided with two-way card data interface device (10 ') is the smart card reader (22 therein, IC chip 4 from the control unit 30 of) according to one embodiment of the present invention and a second data receiving unit 34 for receiving receives the been provided with a switching unit for switching a transmission path of data transmitted from the data or the smart card reader (22 ') transmitted from the external device (6) has been 38 are respectively connected to the first and second data receiver (36,34). 또, 상기 스위칭부(38)에 스위칭 제어신호를 발생하기 위한 주제어부(42)가 구비되어져 있으며, 상기 스위칭부(38)의 출력단에는 데이터 송신부(40)가 접속되어져 있고, 그 데이터송신부(40)는 상기 스위칭부(38)를 통해 전달경로가 설정된 상태에서 상기 외부 기기(6)로부터 전달된 데이터 또는 상기 스마트카드 리더(22')로부터 전달된 데이터를 인가받아 상기 USB 포트(16)로 전송하는 역할을 수행한다. Further, the main control unit 42 for generating a switching control signal to the switching unit 38 and been provided, and an output terminal of the switching unit 38 has been data transmission unit 40 are connected, the data transmission unit (40 ) is transmitted in a state in which the transmission path is set through the switching unit 38 to the data or the smart card reader (22), the USB port 16 is receiving the data transmitted from the transmission from the external device (6) It serves to. 바람직하게, 본 발명의 일실시예에 따른 스마트카드 리더가 구비된 쌍방향 카드데이터 인터페이스장치(10')는 그 내부에 상기 주제어부(42)와 접속되며, 상기 데이터포트(14)를 통한 외부 기기(6)가 접속되었는 지를 판단하기 위한 외부기기 감지부(44)가 구비되어져 있으며, 상기 주제어부(42)와 접속되어 상기 스마트카드 리더(22')를 통해 비접촉 IC 카드(2)가 대기하는 지를 감지하기 위한 카드감지부(46)가 각각 구비되어져 있다. Preferably, an embodiment of an interactive card data interface device (10 ') having a smart card reader according to the present invention is connected to the main controller 42 therein, the external device through the data port 14 6 has been provided with the external device detection unit 44 for determining whether or connected, and is connected to the main control unit 42 that the noncontact IC card 2, the atmosphere via said smart card reader (22 ') the card detection unit 46 for detecting whether there been provided respectively. 상기 주제어부(42)는 내부에 설정된 타이머에 의해 일정시간 간격으로 상기 외부기기 감지부(44)와 카드감지부(46)에 감지 제어신호를 발생하여 외부 기기(6)와 비접촉 IC 카드(2)의 존재를 감지하고, 그 감지여부에 따라 상기 스위칭부(38)를 자동으로 스위칭할 수 있게 된다. The main control unit 42 at a predetermined time interval by a timer set therein to generate a sensing control signal to the external device detection unit 44 and the card sensing unit 46, the external device (6) and the non-contact IC card (2 ) detecting the presence of, and it is possible to automatically switch the switching unit 38 in accordance with the detected or not. 상기한 구성으로 이루어진 본 발명의 일실시예에 따른 스마트카드 리더가 구비된 쌍방향 카드데이터 인터페이스장치(10')는 기본적으로 상기 데이터 포트(14)를 통해 외부기기(6)가 접속된 상태의 데이터 전달경로가 상기 스위칭부(38)에 설정되어져 있다. Data in the smart card reader, a two-way card data interface device (10 ') having a basically (6) an external device via the data port 14 in accordance with one embodiment of the present invention made by the aforementioned configuration connection transmission path may have been set in the switching unit 38. 즉, 상기 제 1 데이터수신부(36)를 통해 휴대폰 등의 외부기기(6) 내부에 장착된 IC칩(미도시)으로부터 각종 카드정보(카드의 고유한 일련번호, 사용자의 신용 정보 및 기타 응용 정보 등)를 전달받을 수 있게 설정되어져 있다. That is, the first data receiving unit 36, a proprietary variety of card information (card from the IC chip (not shown) mounted inside the external device (6) such as a mobile phone by using the serial number, the user's credit information, and other application information etc.) has been set up so you can get delivered. 또한, 본 발명의 일실시예에 따른 스마트카드 리더가 구비된 쌍방향 카드데이터 인터페이스장치(10')는 상기 웨이크업 펄스신호 발생부(48)에서 일정시간 간격으로 발생된 펄스신호를 통해 스마트카드 리더(22)의 제어부(30)가 안테나(24)를 통한 카드감지신호를 인지하도록 활성화상태로 변경되는 바, 상기 스마트카드 리더(22')가 활성화되면 안테나(24)를 통해 상기 비접촉식 IC 카드(2)를 자화시켜 내부의 IC칩(4)으로부터 각종 카드정보를 독취하여 상기 제 2 데이터수신부(34) 및 스위칭부(38)를 통해 PC(8)로 전송되게 된다. Further, an embodiment of the smart card reader with two-way card data interface device (10 ') provided with a according to the present invention, the smart card reader through a pulse signal is generated at a predetermined time interval from the wake-up pulse signal generation section 48 After 22 control section 30 of the antenna 24 is a bar, the smart card reader (22) is changed to active state so that the sensing signals card activation via the non-contact IC card through the antenna 24 ( 2) the magnetization is to be taken for various poison card information from the IC chip (4) within the transmission to the PC (8) via the second data reception unit 34 and the switching unit 38. 한편, 본 발명의 일실시예에 따른 스마트카드 리더가 구비된 쌍방향 카드데이터 인터페이스장치(10')의 내부에 외부기기 감지부(44)와, 카드감지부(46)가 구비된 경우라면, 상기 주제어부(42)는 상기 외부기기 감지부(44)와, 카드감지부(46)로부터 감지신호를 인가받아 상기 데이터 포트(14)에 외부기기(6)가 접속되었는 지, 또는 상기 스마트카드 리더(22')의 안테나(24)를 통해 비접촉식 IC카드(2)의 존재가 확인되었는 지를 판단하여, 그 판단에 따라 상기 스위칭부(38)를 스위칭 제어하여 데이터 전달 경로를 자동 설정한다. On the other hand, in case of the on the external device detection unit 44, a card detector 46 is provided inside of the two-way card data interface device (10 ') having a smart card reader in accordance with one embodiment of the invention, the the main control unit 42 is not doeeotneun the external device detection unit 44 and the external device to the data port 14 receives applying a sensing signal from card detector 46 (6) is connected, or the smart card reader it is determined whether or (22 ') is in the non-contact IC card 2 through the antenna 24 of the check, and automatic configuration of the data transfer path by switching control of the switching unit 38 according to the determination. 그로인해, 설정된 전달경로를 통해 상기 비접촉식 IC카드(2)의 정보 또는 상 기 외부기기(6)의 내부에 구비된 IC칩(미도시)의 정보를 PC(8)로 전달할 수 있게 된다. Thereby, it is possible to transfer information in the IC chip (not shown) provided through the set transfer path to the interior of the IC card (2) or a group of the information device (6) to the PC (8). 이를 통해, 본 발명의 일실시예에 따른 스마트카드 리더가 구비된 쌍방향 카드데이터 인터페이스장치(10')는 사용자가 쉽게 휴대하고 다니면서, PC(8)를 통한 온라인 결제가 필요한 경우에 PC(8)에 구비된 USB 커넥터(미도시)에 상기 스마트카드 리더가 구비된 쌍방향 카드데이터 인터페이스장치(10)의 USB 포트(16)를 삽입하고 그 타단에 형성된 데이터포트(14)에 휴대폰 등의 외부기기(6)의 데이터커넥터(미도시)를 결합시켜 외부기기(6) 내부에 장착된 IC칩(미도시)으로부터 카드정보를 독취하여 PC(8)로 전달할 수 있다. Through this, an embodiment of an interactive card data interface device (10 ') having a smart card reader according to the present invention, go around, and user-friendly mobile, PC (8), if necessary, the online payment by PC (8) a USB connector, an external device of the mobile phone or the like (not shown), data ports 14 inserted into the USB port 16 of the two-way card data interface device 10 with which the smart card reader, and formed at its other end to having the ( ml was coupled to the data connector (not shown) of 6) reading the card information from the external apparatus 6, the IC chip inside the (not shown) may be passed to the PC (8). 또한, 본 발명의 일실시예에 따른 스마트카드 리더가 구비된 쌍방향 카드데이터 인터페이스장치(10')는 PC(8)를 통한 온라인 결제가 필요한 경우에 PC(8)에 구비된 USB 커넥터(미도시)에 상기 스마트카드 리더가 구비된 쌍방향 카드데이터 인터페이스장치(10')의 USB 포트(16)를 삽입하고, 그 상면에 다양한 비접촉식 IC카드(2)를 안착시킴으로써 그 내부에 구비된 스마트카드 리더(22')를 통해 IC칩(4)의 카드 정보를 독취하여 PC(8)로 전송할 수 있으므로 범용성이 매우 높다. In addition, in one embodiment a smart card reader with two-way card data interface device (10 ') provided with a according to the present invention, the USB connector with the PC (8) when the online payment using a PC (8) required (not shown ), the smart card provided in therein by inserting the USB port 16 of the two-way card data interface device (10 ') provided with the smart card reader, and seating the various non-contact IC card 2 on the upper surface of the reader ( 22 ') is very high in versatility by taking reading the card information of the IC chip 4 can be transmitted to PC (8) through. 더불어, 본 발명의 일실시예에 따른 스마트카드 리더가 구비된 쌍방향 카드데이터 인터페이스장치(10')는 상기 스마트카드 리더(22')가 상기 웨이크업 펄스신호 발생부(48)에 설정된 시간간격에 따라 스마트카드 리더(22)의 제어부(30)가 간헐적으로 동작하게 되므로 전력 소모가 매우 낮으며, 상기 외부기기 감지부(44) 및 카드감지부(46)를 통해 외부기기(6)의 장착이나 비접촉식 IC카드(2)의 존재를 인지하고 자동으로 데이터 전달 경로의 스위칭이 이루어지므로 편의성도 매우 높다. In addition, one embodiment of an interactive card data interface device (10 ') having a smart card reader according to the present invention, the smart card reader (22' with the time interval setting) is the wake-up pulse signal generation section 48 mounting of the smart card reader 22 of the control section 30 is, so that the intermittent operation with less power consumption is very low, the external device detection unit 44 and the card sensing unit 46, the external device (6) through and along It contactless recognize the existence of the IC card 2, and therefore the automatic switching of a data transmission path composed of convenience is also very high. 한편, 본 발명의 실시예에 따른 스마트카드 리더가 구비된 쌍방향 카드데이터 인터페이스장치는 단지 상기한 실시예에 한정되는 것이 아니라 그 기술적 요지를 이탈하지 않는 범위내에서 다양한 변경이 가능하다. On the other hand, the smart card reader a two-way data card interface device having a according to an embodiment of the present invention is capable of various changes only not limited to the above embodiment within a range not departing from the technical gist. 42:주제어부, 48:웨이크업 펄스신호발생부. 42: wake-up pulse signal generating section: the main control unit, 48. 상기 스위칭부를 스위칭 제어하기 위한 주제어부로 구성되어, 외부기기 또는 비접촉식 IC 카드에 내장된 IC칩으로부터 카드정보를 독취하여 PC로 인터페이스하기 위한 것을 특징으로 하는 스마트카드 리더가 구비된 쌍방향 카드데이터 인터페이스장치. The switching is constituted by parts of the main controller for controlling the switching, the external device or by taking reading the card information from the IC chip embedded in the IC card smart card reader with two-way card data interface device with a, characterized in that for interfacing into the PC. 제 1항에 있어서, 상기 스마트카드 리더는 스마트카드 리더를 활동(Active) 상태로 설정하기 위한 키버튼부와; The method of claim 1, wherein the smart card reader is a key for setting the smart card reader to the active (Active) state button unit; 상기 비접촉식 IC 카드로부터 카드정보를 수신하기 위한 안테나와; And an antenna for receiving the card information from the IC card; 상기 비접촉식 IC카드의 카드 정보를 추출하여 제어부 및 보안응용모듈(SAM)로 전송하기 위한 RF모듈과; RF modules for extracting card information of the IC card to transmit it to the control and security application module (SAM) and; 상기 RF 모듈로부터 수신한 정보를 이용하여 비접촉식 IC 카드를 인증하여 인증 결과를 제어부로 전송하기 위한 보안 응용 모듈과; Security application module to authenticate the IC card by using the information received from the RF module for transmitting an authentication result to the control unit and; 저장 장치에 수신데이터 및 인증데이터를 기록하여 스마트카드 리더에 직렬 통신 케이블을 통해 연결되어 있는 PC에 해당 데이터를 전송하여 결제를 포함한 카드서비스 처리를 수행하는 제어부로 이루어진 것을 특징으로 하는 스마트카드 리더가 구비된 쌍방향 카드데이터 인터페이스장치. Smart card reader, characterized in that consisting of a control unit for performing a storage device receiving the data and authentication by writing data smartcard card service processing, including payment by sending the data to the PC connected via the serial communication cable to the reader in the the two-way data interface card device with. 제 1항 내지 제 2항중 어느 한 항에 있어서, 상기 스마트카드 리더가 구비된 쌍방향 카드데이터 인터페이스장치는 그 내부에 상기 데이터 포트와 직렬 연결되고 그 데이터 포트를 매개로 전송된 외부 기기 내의 스마트카드 칩 정보를 수신하기 위한 제 1 데이터 수신부와; Claim 1 to claim 2 Compounds according to any one of the preceding, the smart card chip in the external device transmitting the smart card reader with two-way card data interface device with a is in series with the data port therein the data port as a medium a first data receiver for receiving the information; 상기 스마트카드 리더의 제어부로부터 카드의 IC칩 정보를 전달받아 수신하기 위한 제 2 데이터수신부와; And a second data receiver for receiving receives the IC chip of the card information from the controller of the smart card reader; 상기 스위칭부의 출력단에 접속되어 상기 스위칭부를 통해 전달경로가 설정된 상태에서 상기 외부 기기로부터 전달된 데이터 또는 상기 스마트카드 리더로부터 전달된 데이터를 인가받아 상기 USB 포트로 전송하기 위한 데이터 송신부가 더 포함된 것을 특징으로 하는 스마트카드 리더가 구비된 쌍방향 카드데이터 인터페이스장치. Is connected to the output terminal of the switching part that in a state in which the transmission path is set through the above switching the receiving application data transmitted from the data or the smart card reader transmitted from the external device further comprises data transmission unit for transmitting to the USB port the two-way data card interface device having a smart card reader as claimed. 제 1항에 있어서, 상기 스마트카드 리더가 구비된 쌍방향 카드데이터 인터페이스장치는 그 내부에 상기 USB 포트의 전원단과 접속되며, 상기 스마트카드 리더로 전원을 인가시키기 위한 충전부가 더 포함된 것을 특징으로 하는 스마트카드 리더가 구비된 쌍방향 카드데이터 인터페이스장치. According to claim 1, wherein said smart card reader with two-way card data interface device having a are connected end and power supply to the USB port therein, characterized in that the charging unit for supplying power to the smart card reader further comprises the two-way data card interface device having a smart card reader. 제 1항 내지 제 2항중 어느 한 항에 있어서, 상기 스마트카드 리더가 구비된 쌍방향 카드데이터 인터페이스장치는 그 내부에 상기 주제어부와 접속되며, 상기 데이터포트를 통한 외부 기기가 접속되었는 지를 판단하기 위한 외부기기 감지부와; Claim 1 to claim 2 Compounds according to any one of the preceding, wherein said smart card reader with two-way card data interface device with a is connected to the main control unit therein, the external device through the data port is to determine a connection destination doeeotneun external device detection unit; 상기 주제어부와 접속되어 상기 스마트카드 리더를 통해 비접촉 IC 카드가 대기하는 지를 감지하기 위한 카드감지부가 더 구비되어져 있으며, 상기 주제어부는 내부에 설정된 타이머에 의해 일정시간 간격으로 상기 외부기기 감지부와 카드감지부에 감지 제어신호를 발생하여 외부 기기와 비접촉 IC 카드의 존재를 감지하고, 그 감지여부에 따라 상기 스위칭부를 자동으로 스위칭하는 것을 특징으로 하는 스마트카드 리더가 구비된 쌍방향 카드데이터 인터페이스장치. The main controller is connected and has been added further includes the card detection for detecting whether the non-contact IC card is waiting via the smart card reader, the main control unit at a predetermined time interval by a timer set in the internal sense the external device unit and a card and generating a sensing control signal to the detection unit detects the presence of the external device and the non-contact IC card, a smart card reader, characterized in that switching to the switching unit automatically provided, depending on whether the detected two-way data card interface device. 제 2항에 있어서, 상기 스마트카드 리더는 그 내부에 상기 제어부와 접속되어져 있고, 일정시간 간격으로 제어부에 펄스신호를 발생시키며, 그 펄스 신호에 의해 구동되어 비접촉식 IC 카드의 접근감지용 신호를 생성하기 위한 웨이크업 펄스신호 발생부가 더 포함된 것을 특징으로 하는 스마트카드 리더가 구비된 쌍방향 카드데이터 인터페이스장치. The method of claim 2, wherein the smart card reader has been connected to the control unit therein, and generate a pulse signal to the control unit at a predetermined time interval, is driven by the pulse signal generates a signal for the non-contact IC card access detection wake-up pulse signal generating additional smart card reader with two-way data card interface device having a characterized in that the further comprises for.